Back in 2007, two years into Frank Arnesen’s tenure at Chelsea, the academy made something of a statement that their target was to provide Chelsea’s first-team squad with a regular member by 2010, with at least one to follow every year from there on. With less than 48 hours until the turn of the year, the club has perhaps never looked closer to achieving that milestone than they are right now. It’s certainly interesting, because for a large portion of the last three years, it hasn’t seemed especially likely. There’s been the odd pretender, the likes of Scott Sinclair or Ben Sahar, but as we gear up for the second half of the 2009/10 season, there are four individuals poised to make good on the academy’s wishes, with others potentially following. To start with though, we should go right back to 2005, when Arnesen took over. At the time, the club had just taken on a healthy number of scholars including Bristol Rovers’ flying forward Sinclair, Gillingham full-back Ryan Bertrand and a host of other players, largely acquired from elsewhere. Throughout the course of the 05/06 season some of them thrived, with Sinclair finding the back of the net 20 times for the youth and reserve sides, and the following season saw him make his first team debut in a campaign which also saw Sahar, Michael Woods, Sam Hutchinson and Nuno Morais blooded, with Lee Sawyer and Yves Makalambay close to following as unused substitutes. With a manager in Jose Mourinho who was not afraid to give youngsters their chance where possible, Arnesen’s initial hopes were looking good. Or were they? The club changed its tune in the 2007 summer, setting a longer-term goal for their supply to the big boys. Having taken a look at what they had, and what was needed to now compete in Chelsea’s first team at the levels the club were competing at, academy staff evidently felt a better quality of player was needed from age sixteen upwards, and so began the acquisition of a group of players who are now looking like they might be the ones to make good on the altered plans. Fabio Borini, Gael Kakuta and Jeffrey Bruma all came to England that summer and were joined by Patrick van Aanholt, Jacob Mellis, Conor Clifford, Jacopo Sala, Daniel Philliskirk and others. 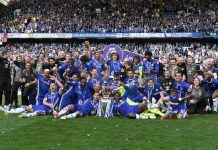 Whilst the progress of the latter set of players has been largely positive, it’s the first three who are catching the headlines and the attentions of Chelsea fans. All three have appeared for Carlo Ancelotti this season, and perhaps tellingly, all three have made league outings, and two of them Champions League representation. For the most part they have been cameo substitute performances, but they’ve been impressive, and they are gaining trust each and every day. Borini may well be the most surprising of the three. Bruma and Kakuta excelled in their first season at the club, playing superbly in the academy league, but the Italian striker struggled to settle and whilst seven goals was a decent return, he didn’t really show any signs of being somebody who could play for the first team. Twelve months later the turnaround was astounding, with Fabio averaging a goal per game over the duration of the season and having stepped up to the Reserve squad and continued that run. Having put in hours of extra work with the coaching staff (especially the vastly under-rated Paul Clement) and settled in England (and comfortable with the language), he was ready for another assault on the Reserve league with an aim to getting a look-in to the first team at the end of the season. He only had to wait until September. Having opened the season scoring goals for fun in pre-season, his clinical finishing and impressive tactical development caught the eye of his compatriot manager, and with Didier Drogba suspended for Champions League action and Daniel Sturridge toiling injured, he was called into the squad for the home game against FC Porto. He didn’t get on, but he did make a league debut against Tottenham the same week, before starting for the first time against QPR in the League Cup. He has six appearances to date (and an Italian Under-21 debut) and has made such an impression that his manager is comfortable not bringing in reinforcements for January, when Drogba departs for African Nations Cup duty. Meanwhile, Kakuta’s name has exploded onto everybody’s lips this year after the club was banned for two transfer windows for encouraging him to break his contract with Lens back in 2007. Initially banned for four months for his part in the controversy, the Court of Arbitration for Sport suspended the punishment whilst they investigate the appeal, meaning Gael became available for selection back in November, and after two months of extra training and work with the first team, he was given his debut at home to Wolves. It was an electrifying entrance, with goalscoring chances, skill, confidence and a youthful exuberance which belied his traumas. Another sub appearance came away to Blackburn in the League Cup before he started his first game, a Champions League tie with APOEL Nicosia. Ancelotti considers him technically ready to play every game, but physically not yet, so his appearances will be meted out over the coming months as he adapts to playing against men. The third is Jeffrey Bruma. Having only just turned 18, he’s been ahead of the curve every step of his career, moving to England at fifteen, playing for the reserves before his sixteenth birthday, and captaining them aged 17 whilst making his Dutch Under-21 debut. His Premier League debut came at the same age against Blackburn in October and he played the second half and extra time away to the same opponents in the League Cup. Some observers considered him the team’s best player on the night, and a smattering of Dutch journalists have even advocated taking him to next summer’s World Cup Finals, such is the lack of any exceptional ability at the heart of the Oranje defence. It’s important not to get over-confident in the trio, or to think that they’ve made it, but it’s so very refreshing to see a manager use them early in the season, in important games at important times. Luiz Felipe Scolari teased at the idea but never commited to it, and Avram Grant had no opportunity to do so, simply focusing on winning the next game ahead of him. With a (hopefully) stable manager, the early excitement Borini, Kakuta and Bruma have provided will hopefully go a long way to ensuring their permanent place in next season’s squad, especially as key players in their respective positions are past 30 and the transition to replacing them is approaching fast. It would be extremely remiss to end this piece without mentioning Sam Hutchinson, who has also played for the first team at Fulham this season, and then in the League Cup against QPR, where he earned the man of the match award under the watchful eye of Stuart Pearce. He earned a call-up to Pearce’s England Under-21 squad but pulled out injured and hasn’t been fit since. At 20, he is older than the others but has been around the first team longer and the official website considers him a part of that squad, and not the reserves. When he’s fit, he more than deserves to be in the conversation.